Add soft and subtle texture to your decor with the Starling rug. Handmade from 100-percent wool, the plush cream pile features a raised trellis print for depth. Pair this carpet with a sofa and add lovely accents for contemporary flair. Option: Cream - 8' 6" x 11' 6"
Rug is just okay. The wool quality is nice and quite soft but there was a stain on the rug. Tried to remove but couldn't get it out (approx 3 inch in diameter) There are specks of grey yarn in odd spots throughout that give the appearance of dirt/stain. Also, as far as the color goes, it is more of a yellow hued cream than on the whiter side of cream in case you are curious. I like this rug. It does shed. You have to vacuum it daily to reduce the shedding, especially if you have dogs and kids laying on it as the hair from the rug does transfer. It had a few pulls here and there, but the sale price was decent so I'm fine with it. It's ivory color. It is not a deep or yellowish cream. It appears as photographed, which is rare. It's a good basic that goes with everything. I've purchased wool rugs in Japan, and the quality was superb. This is not that quality. It's a basic rug that vacuums well and repels dirt if vacuumed reguarly. Very pleased with the quality of this rug. Option: Cream - 7' 6" x 9' 6"
Option: Orange - 7'6" x 9'6"
I am very pleased with the quality of this rug. Looks great in our den. This is a great rug for the price. I'm happy with my purchase! It looks really nice! The color is fantastic, there are minute speckles, but hardly anything to complain about. The only thing is it's not super soft, but it's also a fairly short pile, so if you're looking for something super soft and plush then you'd want to go with a shag rug. I'd recommend it! The rug came exactly as described and arrived quickly! The rug does shed, but that is expected from a wool rug and it's nothing to keep up with. The color is pretty close to the picture. In fact, I took a picture of the rug with my phone when it arrived and it looked identical to the picture on the website. Love this rug!! Would purchase again! Option: Grey - 9' 6" x 13' 6"
I love the shade of grey, and the pattern. It looks expensive. We didn't find it to be rough as some reviews mentioned. It has a typical wool feel but is comfortable to walk and sit on. I do agree that it sheds quite a bit but hoping that will subside with time. I didn't give it 5 stars because of how easily it seems to snag. 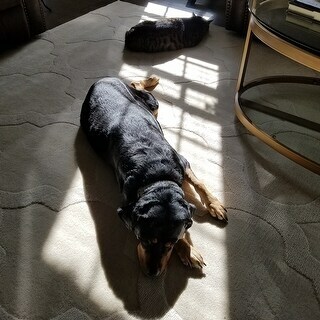 But with that said, we do have two dogs and at least when it does snag it's so far been easy to hide/fix. I would purchase again or one similar. This carpet fuzzed all over the house. Every time you walk across it, fibers are dragged around the house. I vacuumed many times and each time the carpet shed lots and doesn't stop. Eventually we gave up and put it in the cat's room and the cat pulled apart the pattern areas and then we tossed it. Would not buy again! There is nothing special about this rug. It is tone in tone and really no color variance. The gray is more of a taupe in my opinion. I would have sent it back if it wasn't such a hassle with customer service. I tried and gave up. Beautiful but sheds constantly! After vacuuming every other day for a month it still sheds. Never had a rug do this before so now I understand the frustration! Pattern and color are fantastic. My dog has gotten it dirty already with mud but my portable carpet shampooer cleaned it up perfectly. If you can live with the lint, it's a good deal. Do not buy! 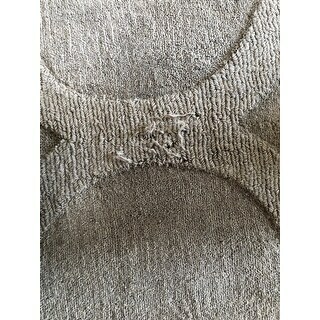 I received this rug 8 months ago and it is falling apart! There was a line that I thought was a crease from shipping, but it turns out it’s a defect! Now there are holes with no wool in it along that crease! Also under the ottoman it’s unraveling! Luckily no one can see that! Very cheaply made!! I do not recommend!! I gave it one star because it is a pretty rug. This is a classic looking rug. Very understated and elegant. Problem - sheds like crazy. It's all over the house. Vacuum only makes it worse. Lovely and subtle pattern. Does shed a lot (but not as much as some of the reviews said that had me panicked!) Is easy for dog's nails to catch and pull up threads - so beware if you have a lot of pets in your household. 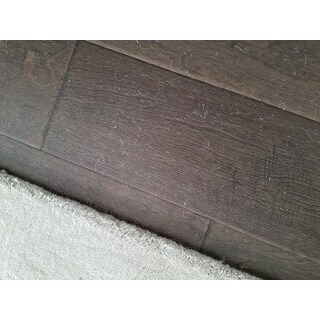 Option: Grey - 2'6" x 8' Runner | Grey - 7' 6" x 9' 6"
Pretty shade of grey, minimal shedding for a wool rug. Overall very classy addition to my dining room. Really beautiful, classic, gorgeous and looks so beautiful than photo. I used in my livingroom and looks perfect. I recommend 100 % this amazing piece. Happy! Option: Grey - 7' 6" x 9' 6" | Grey - 8' 6" x 11' 6"
We have bought a lot of handmade. This rug just looks very cheap instead with the surface weight of the cut pile is very low (less dense) which one of the reason why it sheds terribly. Secondly the material used is more likely cheap indian wool which can be seen on the broken yarn throughout the rug. We bought 2 piece, size 9x12ft and 5x8ft. Both quality is extremely poor. Love this rug! Feel great as nd looks great! The only draw back is that we have a cat and he's pulled up a couple loops. My problem, not the rugs. "Hello there, could you please tell me where I can find the chair that's in the picture of this rug? Thank you!" Unfortunately, we do not currently carry that particular chair. 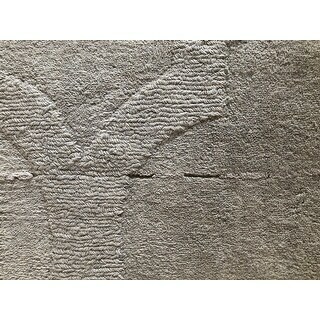 "Is this rug ALL grey or is the trellis design an "off-white" as stated in the description? One picture is different than the rest of the pictures shown." This contemporary rug is all grey. I hope it helps. "Is this offered in the rust color as pictured? " The rust option has been discontinued. "Is this rug a true gray? It doesn't look blue does it?" 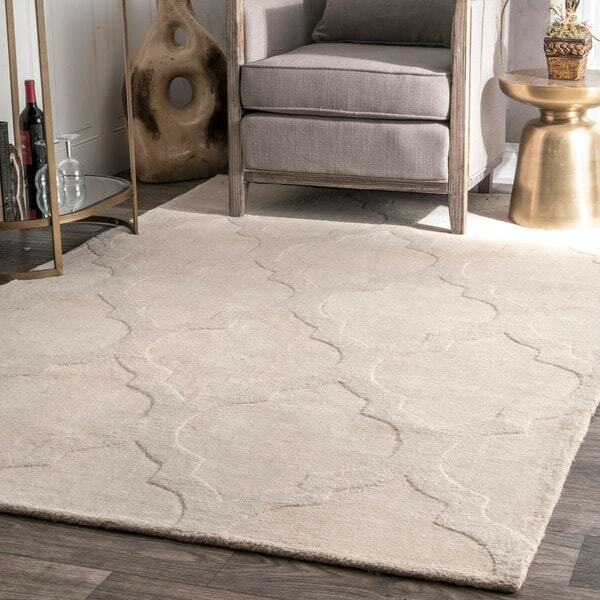 The nuLOOM Handmade Abstract Raised Trellis Wool Grey Rug (4' x 6') is a stone-grey color, no blue. "This looks aqua in the photo. Could I get a more accurate description of the color, from someone who has actually seen the carpet in person?" It is a dark green colour with a tint of yellow, like that of moss, not aqua. "Is the cream a darker beige/cream or more of an ivory?" "This rug would be perfect for my room, depending on the color. I am using brown gray tones, not blue gray tones; since one customer described it as a taupe gray, I have some hope it might be right. Do you offer a returnable sample that I could order, or does it come in a small and easy to handle size? Because it is so large, I don't want to order it until I see the color.n. Thank you."